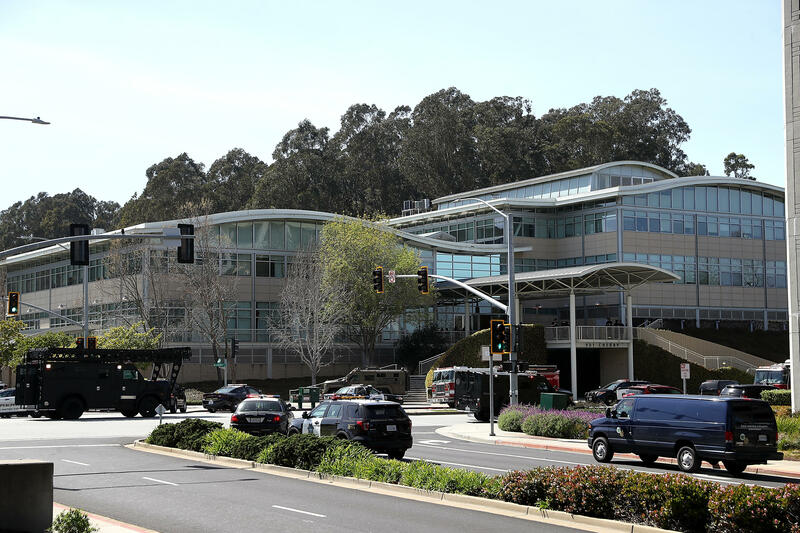 Terrified employees fled as gunfire rang out at YouTube's sprawling headquarters in San Bruno, California, on Tuesday, prompting a massive police response and evacuation as victims were transported to nearby hospitals. San Bruno police identified the suspect late Tuesday as Nasim Najafi Aghdam, 39, who was found dead from what authorities believe is a self-inflicted gunshot wound. His department said it is working to identify a motive for the shooting. Earlier reports indicated the suspect may have known one of the victims, but police said late Tuesday that "at this time there is no evidence that the shooter knew the victims of this shooting or that individuals were specifically targeted." Barberini said police arrived on scene at 12:48 p.m. local time and encountered frantic employees fleeing the building. "It was very chaotic as you can imagine," he said. Police said they are investigating the motive for the shooting, but Aghdam's videos and website are filled with criticism of YouTube. Sources said she initially asked for one of the male victims by name, and that she used 9mm handgun during the shooting. Jaclyn Schildkraut, an expert on mass shootings research and assistant professor at the State University of New York (SUNY), told CBS News it was "very uncommon" to see a female suspect carry out this type of shooting. Women made up of only four percent of mass shooting suspects in the U.S. between 1966 and 2016, Schildkraut said. However, Tuesday's shooting might not fit the definition of a mass shooting. The Gun Violence Archive defines it as four or more people shot or killed -- excluding the shooter. The suspect's father, Ismail Aghdam, told CBS Los Angeles his daughter had gone missing for several days, and that he called police because he was concerned over her recent anger at YouTube. He said police eventually found his daughter and said she was in a car in Mountain View, about 28 miles south of San Bruno. When the family realized she was close to YouTube's headquarters, they told police she said the company was "ruining her life." He said police told the family they would keep an eye on her. The family believes she did not know anyone at YouTube personally. A Mountain View Police spokesperson confirmed to CBS News that they located a woman by the same name asleep inside a car early Tuesday. They confirmed that this was a missing person from Southern California and had notified her family. Ismail Aghdam told Mercury News his daughter was angry because the company stopped paying for content she posted online. Her website accuses "new closed-minded" YouTube employees of reducing her view count, suppressing her and discouraging her from creating content on the video platform. In a now-deleted video, she complained that YouTube began filtering her page and adding age restrictions her videos. A spokesman for San Francisco General Hospital told CBS News it has received three patients: a 36-year-old man in critical condition, a 32-year-old woman in serious condition and a 27-year-old woman in fair condition. Heavily armed police surrounded the facility, with armed SWAT vehicles stationed outside. Police officers could be seen patting down employees evacuating the campus to a nearby parking lot, where they were surrounded by police cars. White House press secretary Sarah Sanders said President Trump has been briefed on the shooting and they are "monitoring the ongoing situation." Mr. Trump tweeted his "thoughts and prayers" to everyone involved. The FBI and San Francisco Field Division of the Bureau of Alcohol, Tobacco, Firearms and Explosives (ATF) said it was responding to the scene. Several employees tweeted they heard gunfire Tuesday afternoon. Vadim Lavrusik said he barricaded himself and others inside a room before they were able to escape safely. Todd Sherman, a product manager at the company, tweeted that he "saw blood drips on the floor and stairs." Google, YouTube's parent company, said in a statement that they are "coordinating with authorities and will provide official information here from Google and YouTube as it becomes available." Google CEO Sundar Pichai said the company is doing everything it can to support the victims and their families. "I know a lot of you are in shock right now. Over the coming days, we will continue to provide support to help everyone in our Google family heal from this unimaginable tragedy," Pichai said in a statement. YouTube's headquarters is about 12 miles south of downtown San Francisco, close to San Francisco International Airport. It encompasses about 200,000 square feet, and YouTube leases the building from Gap, Inc., according to a 2017 article in the San Francisco Business Times. Google says there are more than 1,100 employees at the office and that YouTube is San Bruno's largest employer, with a variety of people dedicated engineering and sales. About 43,000 residents live in the city. The owner of a nearby restaurant told CBS News he was outside smoking a cigarette when he heard several pops. Denny, who didn't want to give his last name, said there was a brief pause in the gunfire before it continued. He said he heard a total of about 15 to 17 shots. "It went on for awhile, those shots, it wasn't like emptying the clip like 'boom boom boom,' it was more of a slower pace," Denny said.